Addressing a rally at Bordumsa in Changlang district, Shah insisted that political stability returned to the state after the BJP formed government in the state. 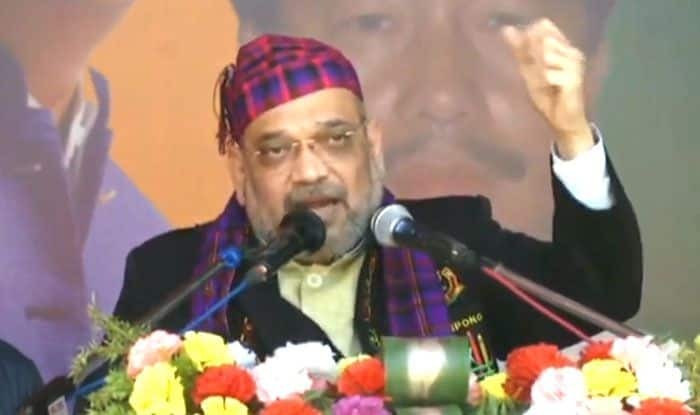 Exuding confidence that the BJP will be re-elected at the Centre, party president Amit Shah said on Friday it was the Modi government that brought peace and development to the northeast, where militant activities were rampant even five years ago. Addressing a rally at Bordumsa in Changlang district, he said the saffron party is committed to taking action against cross-border terrorism and insurgency in the region. Shah also insisted that “political stability returned to the state after the BJP formed government in the state”. Terming the people of Arunachal “patriots”, he said that this Himalayan state withstood the Chinese onslaught in 1962 even when then prime minister Jawaharlal Nehru, in a statement, expressed helplessness for Assam. “Even five years ago, the northeast region was disturbed, there was hardly any development owing to militant activities among other roadblocks. The BJP has brought peace to the region and paved way for its development,” he claimed. The BJP chief also pointed out that Prime Minister Narendra Modi has instructed his ministers to visit the northeast states every fortnight and resolve the problems of the region. “All parts of the northeast now have air and rail connectivity. In Arunachal alone, the government has sanctioned Rs 50,000 crore for the development of roads,” he stated. Highlighting the achievements of the NDA government for Arunachal, Shah said the state was the first in the northeast to get its two cities – Itanagar and Pasighat – into the list of smart cities under the Smart City Mission, besides air services to Pasighat and Tezu under the UDAAN scheme. Hitting out at the Congress, he said the development work had come to a halt under the grand old party. The Congress has made no effort during its tenure to root out terrorism or corruption from the country, he said. “When Modi ji took action against Pakistan-sponsored terrorist groups by ordering an air strike on their camps, post the Pulwama attack, a pall of gloom descended on Pakistan and on the face of Rahul Gandhi,” Shah claimed. Noting that Morarji Desai was the last prime minister who attended meetings of the Northeastern Council, he said 40 years later, it was Modi who attended the convention in Shillong. From Arunachal Pradesh to Kanyakumari, Assam to Gujarat, the BJP will form government, the party’s national president said, adding that the winning streak of the party has started in this state. “It is for the first time that BJP is fighting on all assembly seats in Arunachal Pradesh. Our winning streak started in this region when three MLAs of our party were elected uncontested,” he maintained. Three party candidates had been elected unopposed in the state from Aalo East, Yachuli and Dirang assembly constituencies. Appreciating Arunachal Pradesh Chief Minister Pema Khandu for his efforts to usher in development in the state, the BJP president said the state government organised ‘sarkar aapke dwar’ (government at your doorstep) in almost all the districts to reach out to as many people as possible. “It is because of the NDA government Arunachal got its first medical college, while the project to bring mobile connectivity to the state is also on fast track,” he added. Arunachal Pradesh is going to simultaneous Lok Sabha and assembly polls on April 11.